Volunteer puppy raisers for Canine Companions for Independence expect to have their young four-legged charges in their care for fourteen to sixteen months. For those of us who find it easier to toss out rough estimates, we have been heard to refer to this time span as just about a year and a half. That’s a long time, right? We have a lot to do over those months, to be sure. Loads of socialization and the training of thirty CCI commands. And a bit of falling in love with the puppy. Just kidding. We adore this amazing critter. Who wouldn’t? 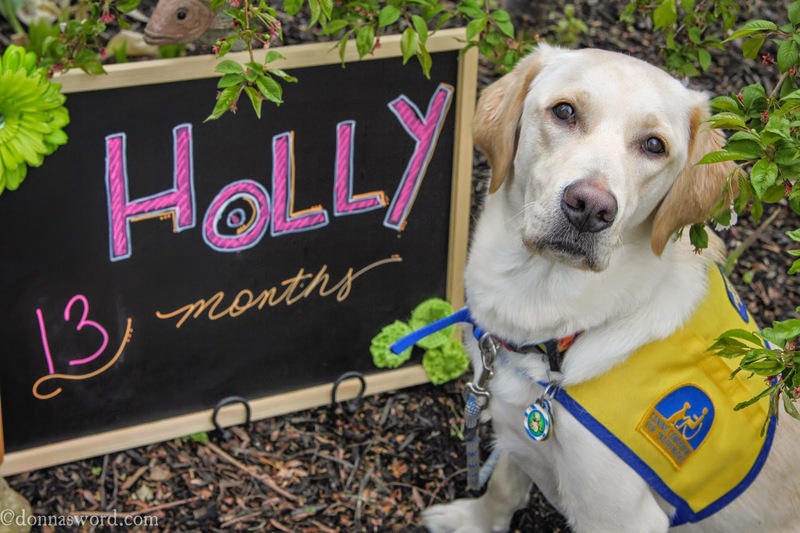 So even though I train Holly with her destiny in mind, I don’t usually start thinking about the countdown to turn-in time until somewhere after the puppy’s first birthday. 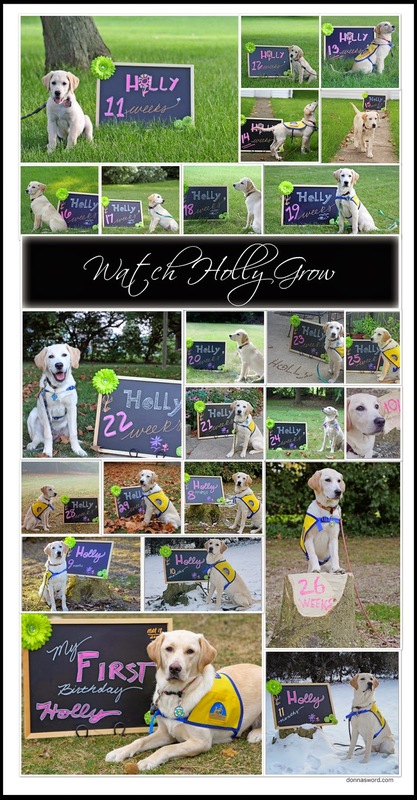 Holly’s matriculation to CCI’s Advanced Training Program will be in November this year. Well, by my finger count, that’s seven months from now. We have a whole summer and most of the fall season to go. Not bad. We’ll keep plugging along here and see if we can reach proficiency on these commands of hers. And I’ll just mark the calendar for another day to worry about turn-ins and the good-byes and good lucks that all go together. That would be so hard, thinking about the goodbyes! It's a wonderful thing that you're doing and Holly's going to be an amazing helper and best friend to someone that really needs her. Yep indeed, it's a tough day at turn in time. Can't sugar coat that. But we know this gorgeous dog has a destiny bigger than the likes of us. Someone is waiting for a dog just like her. Thanks for the kind words! And a Happy Wordless Wednesday to you. Isn't that fun? I can't believe I stayed on a schedule and took the weekly photos. So glad I did, because it's pretty awesome to see her grow at a glance. Thanks for stopping by and Happy WW to you! Sloppy kisses to you, our sweet friend. Love the pictures…..wonderful thing to do!!! !